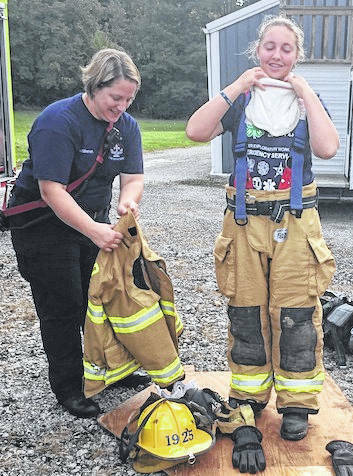 Rocki Huddleston aids Christina Beheler while trying on nearly 60 pounds of turnout gear that firefighters typically wear while fighting fires. Participants, volunteers, and professionals that participated in the workshop along with the emergency vehicles and even MedFlight. Training Officer Jessica George teaches youth about how to use a cardiac monitor in the back of a squad. This also gave youth the feel of how little room they have while working on patients in the squad while on the move. MOUNT GILEAD — Self-defense tactics, learning to intubate patients, crime scene investigations, spraying fire hoses and so much more happened during the OSU Extension’s Career Exploration Workshop – Emergency Services Day on Sept. 22. This workshop was designed to give youth the opportunity to interact with people who work in a career field their interested in pursuing. With the help of professionals from the Morrow County EMS and 911, Station 19 Firefighters, Morrow County Sherriff’s Office, and the Ohio Highway Patrol, many hands-on educational activities were going on simultaneously in the career fields of EMT and paramedic, firefighter, law enforcement, and Ohio Highway Patrol. Youth chose their career interest area. 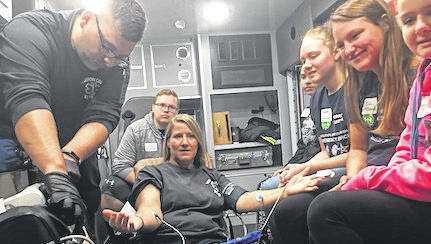 Each area “offered a realistic look into the everyday life of a first responder and showed some of the expectations of someone entering this line of work,” said Mike Carey, Paramedic and Firefighter. Too many times youth think they want to pursue a career without even having tried doing it first. This workshop gave them that opportunity to try the career before committing to expensive trainings or time you could commit to something else if you didn’t like it. According to the youth attendees, the two best parts of the day were the mock crash and the opportunity to be able to talk and work with the professionals one-on-one. Being able to freely ask any questions they wanted to was invaluable. The mock crash was certainly a highlight as the youth played important roles. Youth helped stabilize the “victim” in the car and aided the firefighters as they removed her from the car. Once on the stretcher, they took her to the squad as MedFlight arrived on scene. Once MedFlight was ready they loaded her into the helicopter to be airlifted to a hospital. As all of this is happening, the Ohio Highway Patrol Trooper is narrating to the rest of the youth that isn’t working directly with the victim about what is happening at the scene and what all needs to be done. “The participants of the workshop got the opportunity to learn and practice some of the skills that we use in the field every day. In addition, they received information on the training that is required to begin a career in the different fields,” said Carey. If you have an idea for futures career topics or have questions contact Amanda Forquer at forquer.13@osu.edu. Amanda Forquer is 4-H Youth Development Educator, OSU Extension.